New painting is added to section "Private Possession", canvas named "Sea of Blossom". When I saw the vibrant waves stretching over the slopes near the road, in my mind came an association with the sea surface at sunset. 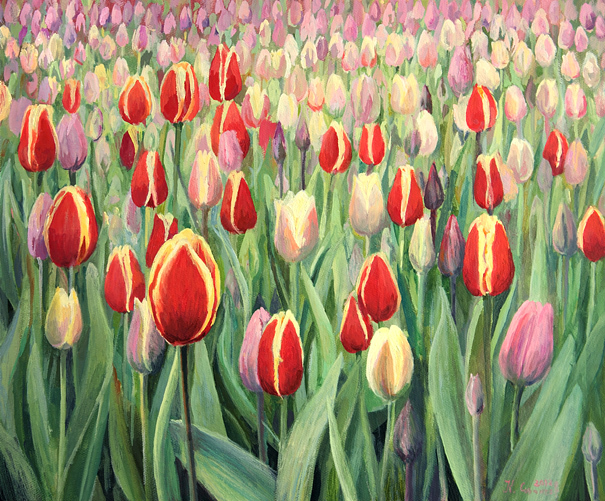 Today I am presenting to you a "Seascape" with the scent of blooming flowers. Когато зърнах пъстрите вълни от цветове по надиплените склонове недалеч от пътя, в съзнанието ми изплува асоциация с развълнувано море по залез слънце. Днес представям пред вас "морски пейзаж" с дъх на цъфнали цветя.Когато зърнах пъстрите вълни от цветове по надиплените склонове недалеч от пътя, в съзнанието ми изплува асоциация с развълнувано море по залез слънце. Днес представям пред вас "морски пейзаж" с дъх на цъфнали цветя. 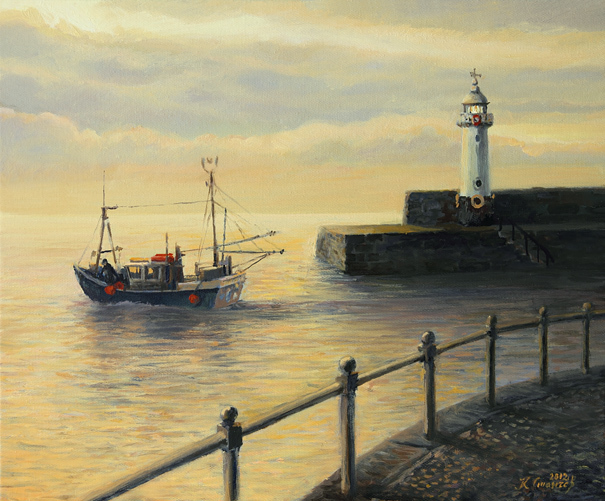 New painting is added to section "Available pictures", canvas named "Memories of The Old Lighthouse". In the early morning the silence was broken by the honk of a seagull. Fishing boat heads to the open sea, floating gently on the smooth water surface. The old port lighthouse flashes brief greeting. I catch myself thinking: How many memories from beautiful mornings is keeping the guardian of Mevagissey? В ранното утро, тишината разкъсва крясък на чайка. Рибарско корабче се отправя в открито море, носейки се леко по гладката водна повърхност. Старият пристанищен фар премигва за поздрав. Улавям се да мисля: Колко ли спомени от красиви утрини пази хранителя на Мевагизи?В ранното утро, тишината разкъсва крясък на чайка. Рибарско корабче се отправя в открито море, носейки се леко по гладката водна повърхност. Старият пристанищен фар премигва за поздрав. Улавям се да мисля: Колко ли спомени от красиви утрини пази хранителя на Мевагизи? 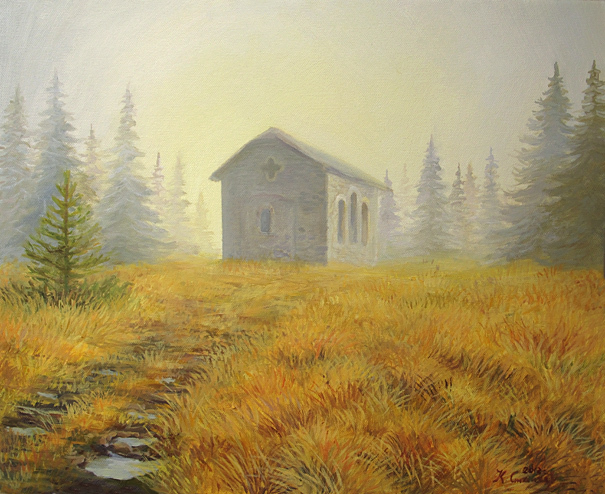 New painting is added to section "Available pictures", canvas named "Cold Weather Is Going Away". 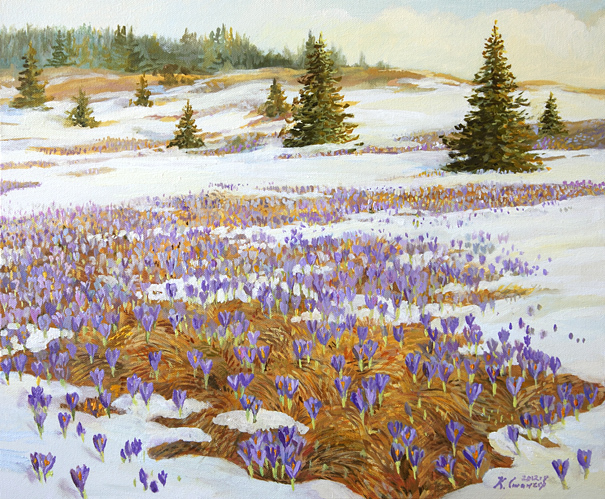 In spite of the gloomy weather in the recent weeks, I have painted a meadow with blooming spring crocus. Reminder to the sun, it's time to smile and to warm us. New painting is added to section "Available pictures", canvas named "Back in Time". Once upon a time ... there was a Castle near Leeds in United Kingdom. 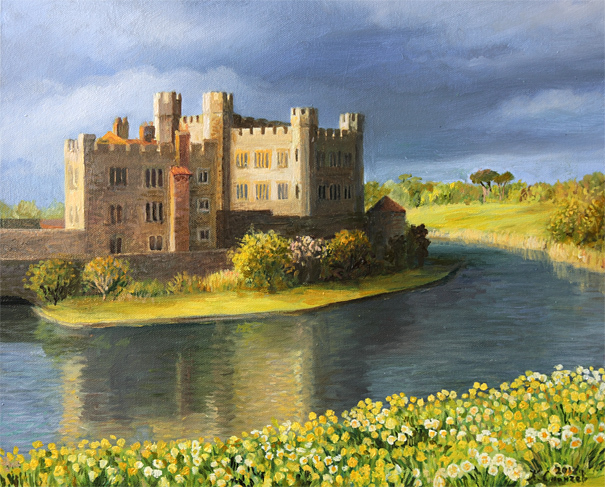 Even today, the first meeting with the castle takes us back to the times of glorious battles, knights in shining armor and fairy tale characters. 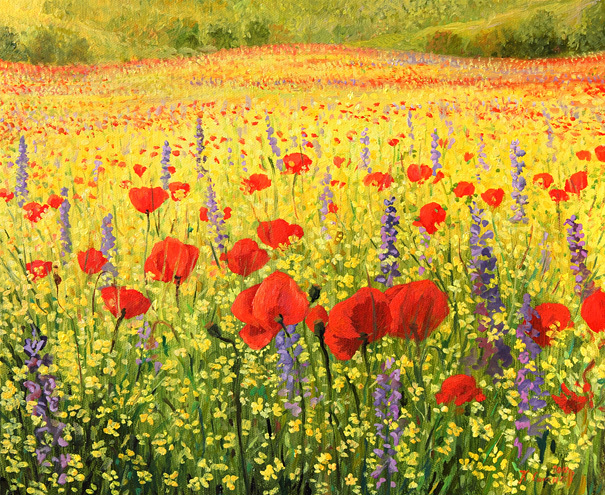 New painting is added to section "Available pictures", canvas named "From The Nature's Palette". In a fairy spectacle, for only three months every year the colors of nature display their annual meeting. In Keukenhof gardens, skilled gardener has arranged his palette. Wishing a colourful weekend to all friends! 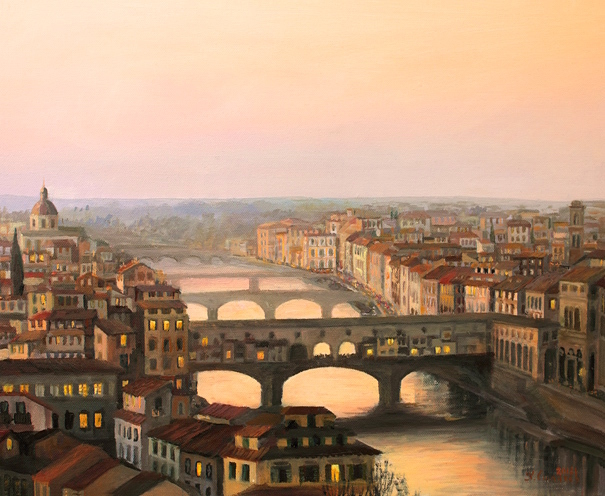 New painting is added to section "Available pictures", canvas named "Sunset over Ponte Vecchio in Florence". My long-held dream was to see Florence, a city with strong ties to the art for centuries. When I got the opportunity to make my dream true, walked through the "gates" of the city with fear whether it will respond to the illusory image of the city created in my mind. Fortunately, Florence was wonderful, and today I share with You, my sunset in the city of the artists. 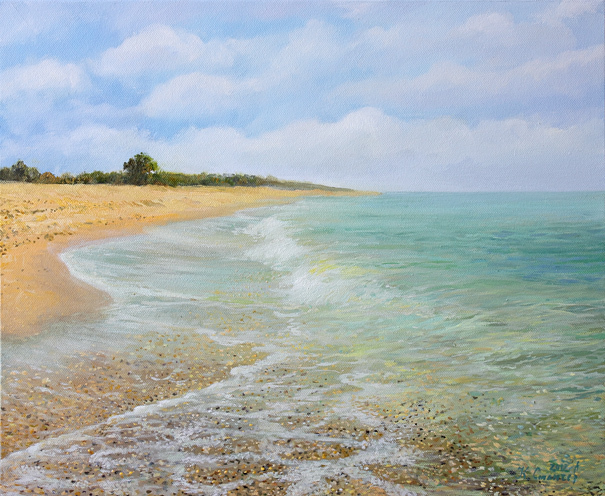 New painting is added to section "Available pictures", canvas named "Beach Krapets". With the warmer weather outside, I'm looking more and more often to the sea coast with longing for the quiet days on the beach early in the season. The splashing waves, gentle breath of the breeze, the positive energy charging hours on the sand, all these made me paint the canvas. With the warmer weather outside, I'm looking more and more often to the sea coast with longing for the quiet days on the beach early in the season. The splashing waves, gentle breath of the breeze, the positive energy charging hours on the sand, all these made me paint the canvas.With the warmer weather outside, I'm looking more and more often to the sea coast with longing for the quiet days on the beach early in the season. The splashing waves, gentle breath of the breeze, the positive energy charging hours on the sand, all these made me paint the canvas. 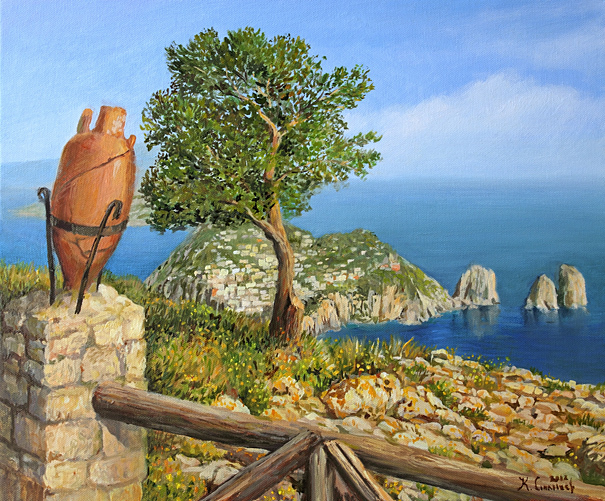 New painting is added to section "Available pictures", canvas named "Monte Solaro on The Island Capri". The view from the highest point on the island of Capri - Monte Solaro is unforgettable. Rocks dressed in picturesque mantle of lush vegetation descend almost vertically to the sea level. Huge open space giving you a sense of freedom. 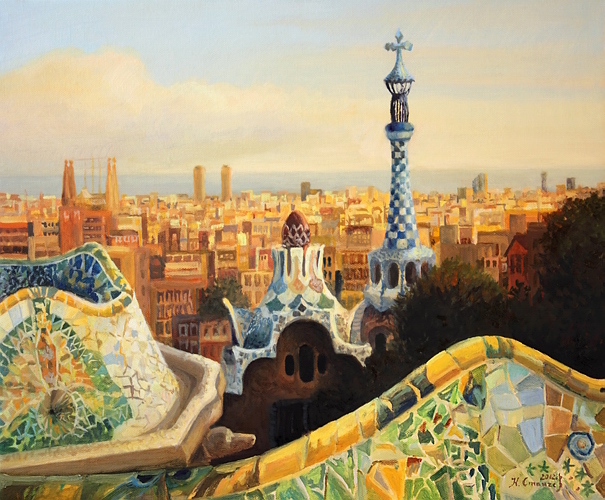 New painting is added to section "Private Possession", canvas named "Barcelona - park Guell". Barcelona is certainly a very beautiful city, but for me the most impressive point in it is the "Park Güell" by Antoni Gaudi. For me it represents the beauty of the human mind and the desire to leave a trail for the next generations. 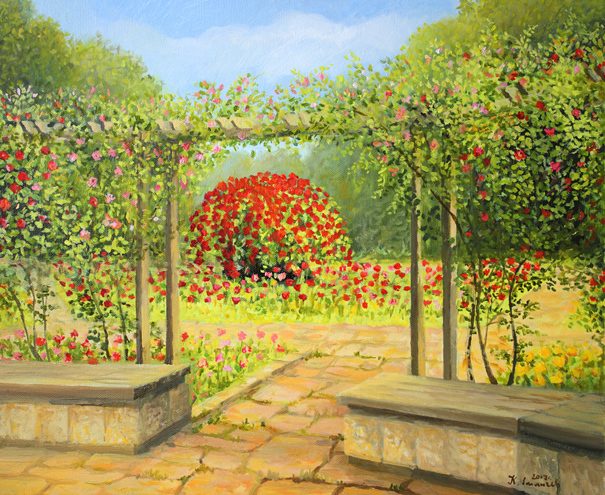 New painting is added to section "Available pictures", canvas named "In The Rose Garden". Today I'm presenting a walk filled with the scent of roses. The park in Rousse hides one of the most beautiful rose gardens in Bulgaria - a favorite place for games of my childhood. България - любимо място за игра от детските ми години.Днес представям разходка, наситена с аромат на рози. В парка на град Русе се крие една от най-красивите розови градини в България - любимо място за игра от детските ми години. New painting is added to section "Available pictures", canvas named "A Touch of Faith". Early morning high in the Rhodope Mountains, a place where heaven and earth touch and a person fills himself with a faith in good and gather strength to walk boldly into the future. 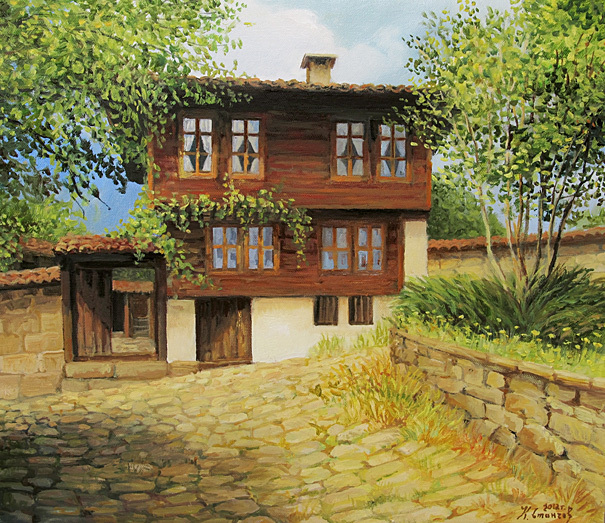 New painting is added to section "Available pictures", canvas named "Kotel - The Ethnographic museum". Ethnographic Museum in Kotel is housed in the Kyorpeev's house. Personally for me this is the most beautiful and picturesque old building in the old quarter of town Kotel. Memories of my visit there in a warm August afternoon. квартал Галата. Спомен от разходката ми там в един топъл августовски следобед.Етнографският музей в Котел се помещава в Кьорпеевата къща, лично за мен най-красивата и живописна сграда в стария квартал Галата. Спомен от разходката ми там в един топъл августовски следобед. New painting is added to section "Available pictures", canvas named "Dance Under Water". Today we will dive underwater to observe a fabulously beautiful dance. 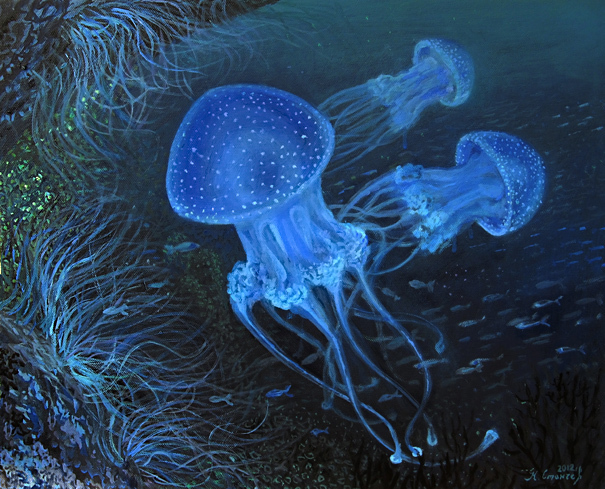 I've met the fluorescent jellyfish in one of the biggest European aquariums and even though I know that this is not the typical subject for a painting, I decided that this beauty deserves to be on canvas. Днес ще се гмурнем под водата, за да наблюдаваме приказно красив танц. С флуоресцентните медузи се срещнах в един от големите европейски аквариуми и макар да знам, че това не е типичния сюжет за картина, реших че красотата им заслужава да бъде представена на това платно.Днес ще се гмурнем под водата, за да наблюдаваме приказно красив танц. С флуоресцентните медузи се срещнах в един от големите европейски аквариуми и макар да знам, че това не е типичния сюжет за картина, реших че красотата им заслужава да бъде представена на това платно. 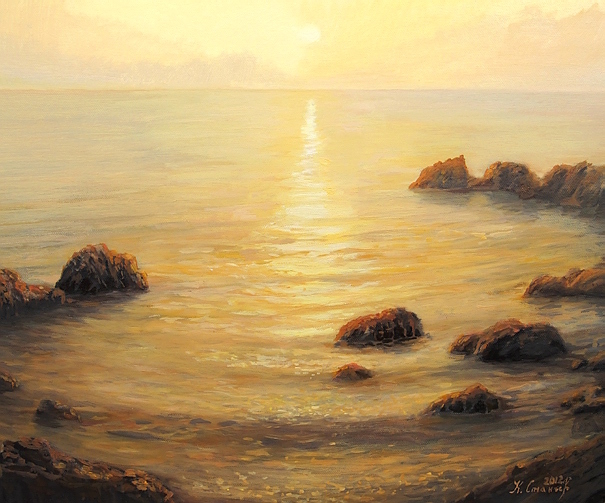 New painting is added to section "Available pictures", canvas named "Golden Sunrise". With winter raging outside, I gave up to the desire to create a canvas bearing in itself a lot of passion and warmth. Longing for summer sunrises on the sea coast early in the morning - alone with the sea. 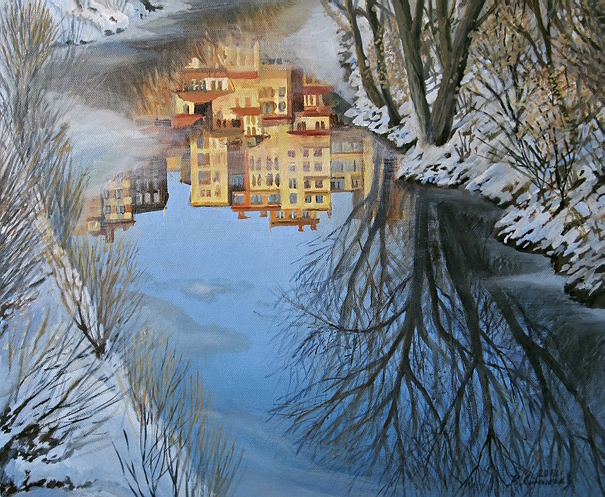 New painting is added to section "Available pictures", canvas named "Reflections". I've met the first day of the 2012 in the old town of Veliko Tarnovo. During a walk in the late afternoon sun, I saw the warm reflection of the buildings in the calm waters of the Yantra River. 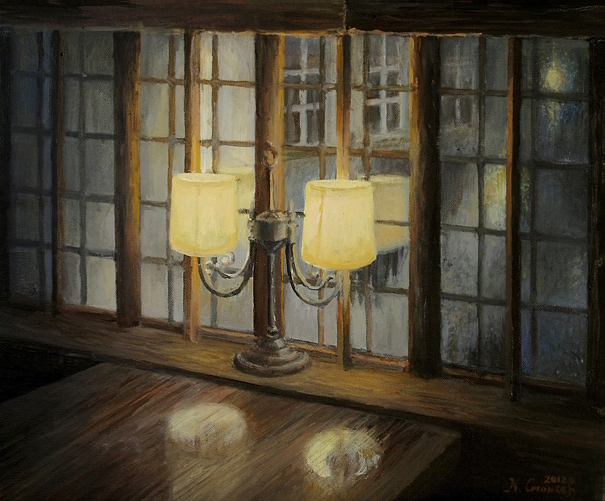 New painting is added to section "Available pictures", canvas named "Evening for Two". Evening, with a loved one to share the warmth behind the hazy windows, to bath in the coziness of soft light, mixed with the scent of old wood and together as a couple to be able to slow the course of time.